Beautiful letter to the Combined Philatelic Exhibition of Chigagoland, Inc from the Comite International Olympique issued in 1959. 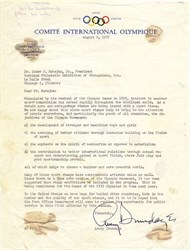 This historic document has an ornate border around it with a vignette of the Olympic's Logo. This item has the signature of an International Olympique President, Avery Brundage and is over 49 years old. Although stained in corners from mounting in a scrapbook, this is an interesting piece of Olympic History. Avery Brundage (September 28, 1887 � May 8, 1975) was an American athlete, sports official, art collector and philanthropist. He has been criticized for attitudes expressed and decisions he made as a member of the United States Olympic Committee and as president of the International Olympic Committee. Born in Detroit, Brundage studied civil engineering at the University of Illinois at Urbana-Champaign, graduating in 1909. A few years later, he founded his own company, the Avery Brundage Company, which was active in the building business around Chicago until 1947. His personal papers are located at the University of Illinois at Urbana-Champaign Archives. Brundage was an all-around athlete, competing in the 1912 Summer Olympics in Stockholm in the pentathlon and decathlon events, finishing 6th and 16th, respectively. He also won the US national all-around title in 1914, 1916 and 1918. In 1928, Brundage became president of the Amateur Athletic Union (AAU). He became the president of the United States Olympic Committee (USOC) in 1929 and gained the vice-presidency of the International Amateur Athletic Federation (IAAF) in 1930. As USOC president, Brundage rejected any proposals to boycott the 1936 Summer Olympics in Berlin, where German Jews were excluded, and became a member of the International Olympic Committee after the group expelled American Ernest Lee Jahnke, who had urged athletes to boycott the Berlin games. On the morning of the 400-meter relay race, at the last moment, the only two Jews on the 1936 US track team, Marty Glickman and Sam Stoller, were replaced by Jesse Owens and Ralph Metcalfe. Glickman later said that that decision might have been the result of pressure from Brundage. Brundage later praised the Nazi regime at a Madison Square rally, and was expelled from the America First Committee in 1941 because of his pro-German leanings. After the 1936 Olympics, Brundage's company, the Avery Brundage Company, was awarded a building contract by Nazi Germany in 1938 to build the German Embassy in America. Brundage was notified in a letter from Nazi authorities acknowledging Brundage's pro-Nazi sympathies. As late as 1971, after many revelations over Nazi Germany's use of the 1936 Olympics for their own propaganda, Brundage still claimed "The Berlin Games were the finest in modern history...I will accept no dispute over that fact". After the death of IOC president Henri de Baillet-Latour during World War II, Brundage became vice-president of the IOC in 1945. Avery Brundage was elected President of the IOC at the 47th IOC Session in Helsinki in 1952, succeeding Sigfrid Edstr�m. During his tenure as IOC president, Brundage strongly opposed any form of professionalism in the Olympic Games. Gradually, this opinion became less accepted by the sports world and other IOC members. It led to some embarrassing incidents, such as the exclusion of Austrian skier Karl Schranz, who was accused of being a professional, from the 1972 Winter Olympics. He opposed the restoration of Olympic medals to Native American athlete Jim Thorpe, who had been stripped of them when it was found that he had played professional baseball before taking part in the 1912 Olympic games (where he had beaten Brundage in the pentathlon and decathlon). Despite this, Brundage accepted the "shamateurism" from Eastern bloc countries, in which team members were nominally students, soldiers, or civilians working in a non-sports profession, but in reality were paid by their states to train on a full-time basis. Brundage claimed it was "their way of life." It was revealed after his death that Brundage had been responsible for notifying the IOC of Thorpes playing professional baseball years before. Brundage also opposed anything that he viewed as the politicisation of sport. At the 1968 Summer Olympics in Mexico City, US sprinters Tommie Smith and John Carlos raised their fists to show support for the Black Power movement during their medal ceremony. Brundage expelled both men from the Olympic Village, suspended them from the US Olympic team and had them stripped of their medals. It must be noted that Brundage oversaw the IOC during the most egregious violations of amateur sportsmanship during the rise of state funded athletics in the eastern bloc. "Every civilized person recoils in horror at the barbarous criminal intrusion of terrorists into peaceful Olympic precincts. We mourn our Israeli friends [...] victims of this brutal assault. The Olympic flag and the flags of all the world fly at half mast. Sadly, in this imperfect world, the greater and the more important the Olympic Games become, the more they are open to commercial, political, and now criminal pressure. The Games of the XXth Olympiad have been subject to two savage attacks. We lost the Rhodesian battle against naked political blackmail. I am sure that the public will agree that we cannot allow a handful of terrorists to destroy this nucleus of international cooperation and goodwill we have in the Olympic movement. The Games must go on...."
To this day the IOC has never officially recognised this tragedy during any of the games held since. Brundage strongly opposed the exclusion of Rhodesia from the Olympics due to its racial policies: after the attacks in Munich, Brundage linked the massacre of the Israeli athletes and the barring of the Rhodesian team (see above). He later apologized for the comparison. Brundage is also remembered for his proposal of elimination of ALL team sports from the Summer Olympics. He also wanted to eliminate the Winter Olympics entirely. This guy was a real prick. Brundage retired as IOC president following the 1972 Summer Games and was succeeded by Lord Killanin. He is, thus far, the only American to hold the office of the IOC President. In addition to his role in sports, Brundage was a noted collector of Asian art. During his lifetime, and by bequest on his death, he gave a massive collection of works of art to the city of San Francisco, California. This collection formed the nucleus (and, as of 2003, still accounts for over half the contents) of the Asian Art Museum of San Francisco, initially founded to house and display his donation. Brundage died on May 8, 1975, aged 87 years, three years after his retirement as IOC president, in Garmisch-Partenkirchen, West Germany. A long time Chicago resident he is buried in the well known northside Rosehill Cemetery. His grave site, understandably so, has been the target of recent pro-Jewish vandals who painted "The People of Israel Lives" in Hebrew on the grass in front of his tombstone, apparently in protest at his perceived pro-Nazi sympathies and his attitude to the attack on Israelis during the 1972 Munich games.